A typical workout doesn’t give you license to eat whatever you want. Even a full hour of vigorous skiing burns just 600 calories — less than the amount in a super-sized fast food sandwich. That’s why it’s important to think of exercise as just one part of a shape-up plan. Exercise works the cardiovascular system and builds muscle, but it takes calorie restriction to also lose weight. 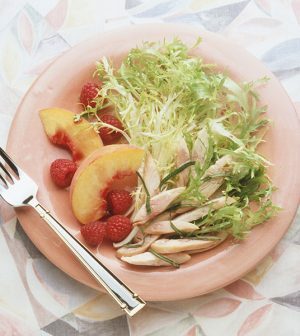 Small diet tweaks that you can make when you’re building a healthier body through exercise will maximize your efforts. Here’s what you need to know about nutrition when you work out regularly. You don’t need to fuel up like a marathon runner, but give your body some nourishment about two hours before every workout to make exercise more effective. Have a small meal with healthy carbs and protein, and some fat. If eating two hours in advance doesn’t work with your schedule, aim for a small snack about an hour before your workout. It’s also important to eat a small meal with carbs and protein within two hours after your workout to give your body the nutrients it needs. Keep in mind that “calories in and calories out” is a balancing act that varies from person to person. So whether you’re trying to lose weight or maintain, keep a journal that records the amount of calories you get from food as well as the amount of calories burned off during workouts to see if your intake needs to be adjusted up or down. Beware of so-called training supplements. These products aren’t regulated, and their claims may not have any science behind them. If you’re getting a good amount of “whole” (unprocessed and unpackaged) foods in your diet, you shouldn’t need any of these aids. Finally, it can’t be stated often enough: Drink water as needed before, during and after exercise to stay hydrated, especially in hot and humid conditions. The U.S. Food and Drug Administration has more about supplement use.